A difficulty of working in such a large and varied collection as ours is that it’s very easy to find yourself on a research tangent, leading off into ever-branching questions that take you further and further from your original point… or, occasionally, lead you right back to it. 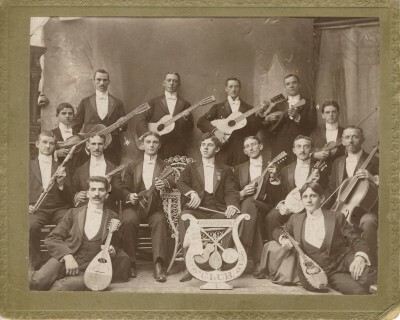 When looking through my list of “this might make a nice blog post” catalog records, I hit upon this photo of the Washburn Club, about which we know very little other than that, according to the donors, it had one Jewish member: Hiram Herman of Baltimore. This seemed like a pleasant, and quick, research tangent for today’s blog… but, as can be expected, it wasn’t quite that simple. After spending some time on it, I must report that the club itself – not to mention which musician pictured is Mr. Herman – is, alas, still a mystery. However, a little research into the Herman family revealed the bones of an interesting wedding story. And, conveniently, weddings are what much of my non-tangential time has been spent on, thanks to this summer’s “Just Married!” exhibit. Newspaper wedding descriptions are a favorite of mine, and this photo led me to some nice ones. 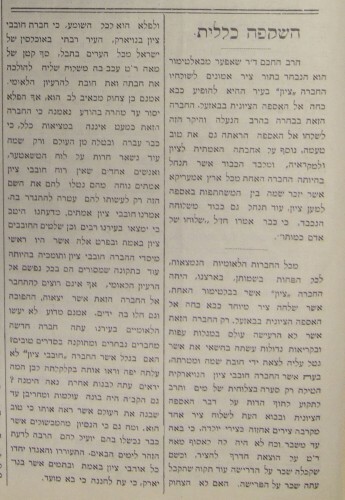 In 1905 Hiram Katz Herman, age 27, and Sarah Whitehill, age 23, were married by Rabbi Guttmacher in Baltimore. After the marriage, Hiram worked as a grocer, and eventually went into real estate. Unfortunately, he died in late 1921, leaving Sarah a childless widow. “HERMAN-WHITEHILL. 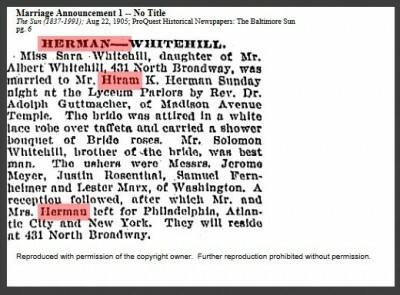 Miss Sara [sic] Whitehill, daughter of Mr. Albert Whitehill, 431 North Broadway, was married to Mr. Hiram K. Herman Sunday night at the Lyceum Parlors [1109 N. Charles Street] by Rev. Dr. Adolph Guttmacher, of Madison Avenue Temple [Baltimore Hebrew Congregation]. The bride was attired in a white lace robe over taffeta and carried a shower bouquet of Bride roses. Mr. Solomon Whitehill, brother of the bride, was best man. The ushers were Messrs. Jerome Meyer, Justin Rosenthal, Samuel Fernheimer and Lester Marx, of Washington. A reception followed, after which Mr. and Mrs. Herman left for Philadelphia, Atlantic City and New York. They will reside at 431 North Broadway.” From the Baltimore Sun, August 22, 1905. Meanwhile, Hiram’s sister Beulah Herman married Solomon Senker in 1910. (The Herman and Senker families were probably neighbors or friends; for example, a list of the attendees of the Majestic Assembly’s first monthly dance of the 1903 season includes Hiram, Beulah, and Solomon’s sister Maud.) Solomon worked for Strauss Bros. clothing as a bookkeeper and office manager; he and Beulah had four children, and lived on Menlo Drive in Park Heights. Beulah died, age 45, in 1932. “Senker-Herman. 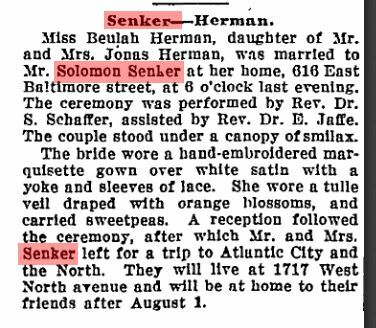 Miss Beulah Herman, daughter of Mr. and Mrs. Jonas Herman, was married to Mr. Solomon Senker at her home, 616 East Baltimore street, at 6 o’clock last evening. The ceremony was performed by Rev. Dr. S. Schaffer [of Shearith Israel], assisted by Rev. Dr. E. Jaffe. The couple stood under a canopy of smilax. The bride wore a hand-embroidered marquisette gown over white satin with a yoke and sleeves of lace. She wore a tulle veil draped with orange blossoms, and carried sweetpeas. A reception followed the ceremony, after which Mr. and Mrs. Senker left for a trip to Atlantic City and the North. They will live at 1717 West North avenue and will be at home to their friends after August 1.” From the Baltimore Sun, July 8, 1910. 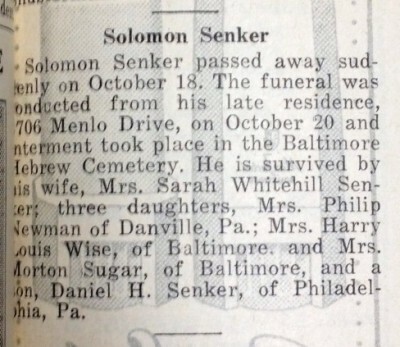 Thanks to Solomon Senker’s obituary, we know that Hiram Herman’s photograph and books were donated by his sister Beulah’s children, Harriet Senker Sugar and Judith Senker Wise. 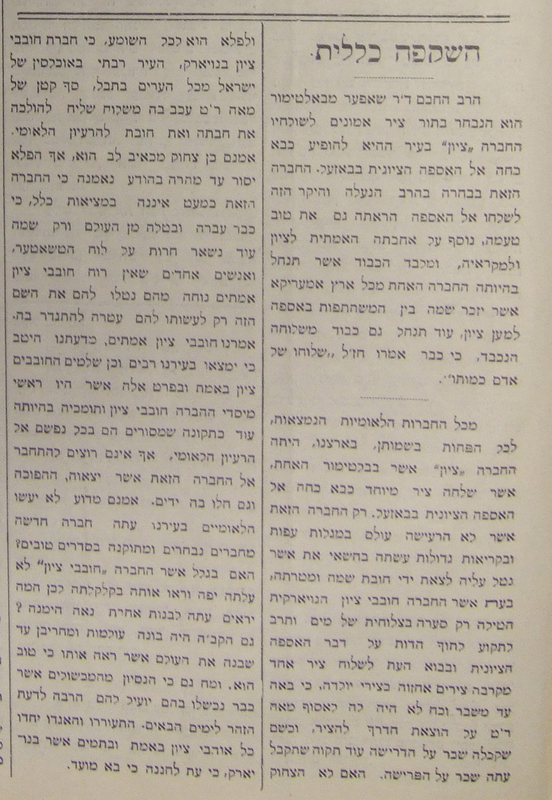 From the Baltimore Jewish Times, October 22, 1948. Without more information, we can only guess at the specific circumstances that would flesh out their history; though useful, wedding notices and census records and obituaries can only tell us so much. Nonetheless, the story of Hiram and Sarah and Beulah and Solomon is a lovely addition to my wedding research, and one that’s a little out of the ordinary. On the other hand, I’m still left with the unsolved problem of the mysterious Washburn Club…. 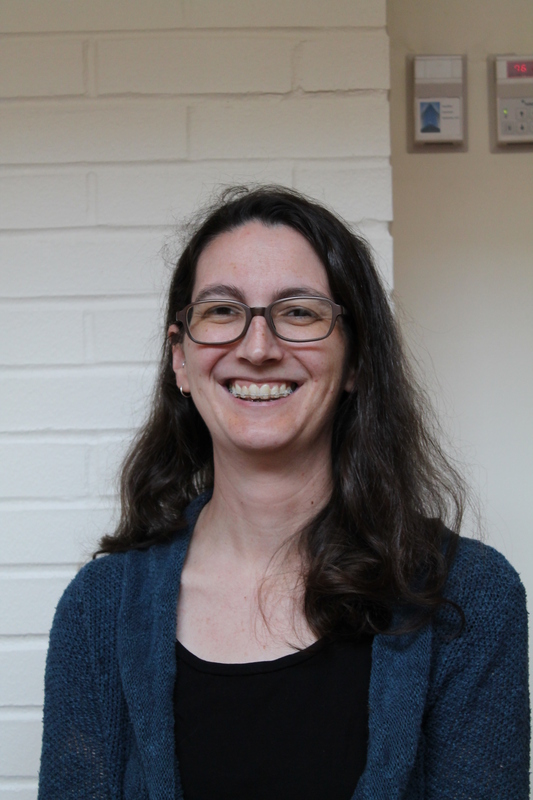 A blog post by Collections Manager Joanna Church. To read more posts by Joanna click HERE.